A new update to the Surface app lets you launch a desktop program with a click of your digital pen. Microsoft is adding some new customization options to the Surface Pen for the Surface Pro 4 and Surface Book. 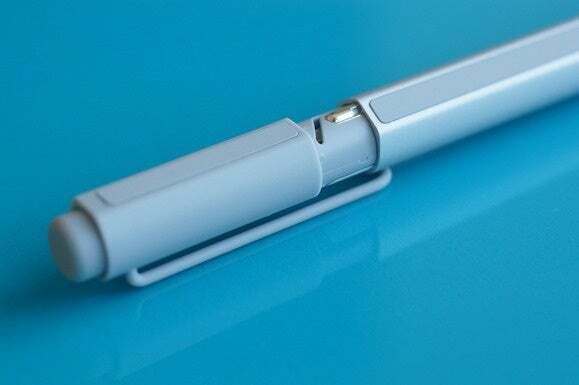 The three-way button on the newest Surface Pen comes programmed with three different functions by default: A single click launches OneNote, double-click takes a screenshot, and press and hold calls up Cortana. With the latest version of the Surface app, however, you can now add a lot more functionality to the Surface Pen, as Windows Central first reported. The defaults remain the same, but you can do away with one or all of them to launch desktop and Windows Store apps instead. There’s also an option to disable each button entirely. Say, for example, you wanted a quick way to call up your web browser. You could assign that to the Surface Pen's single click instead of OneNote. If Cortana isn’t your thing, you might use press and hold to launch Photoshop or an Office program. The impact on you at home: While not a massive update, the ability to customize the Surface Pen’s actions to your liking takes the Surface experience up another notch. Custom launch buttons on the pen can go a long way to better integrating the pen into your workflow. It’s surprising Microsoft didn’t add this functionality out of the box, but you’ll have it as soon as you grab version 10.0.342 of the Surface app, which is available now from the Windows Store.